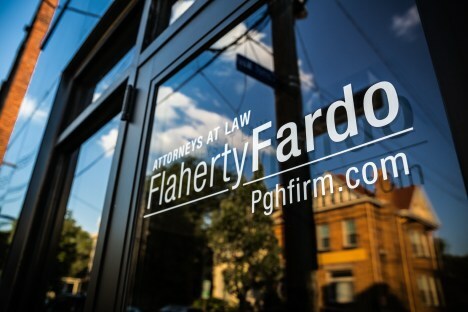 Flaherty Fardo Rogel & Amick is a Pittsburgh law firm located in the Shadyside neighborhood of the city. The firm’s philosophy focuses on helping people, client satisfaction and results. The firm attempts to accomplish this through hard work, integrity and character. Founded in 1997, the firm has deep historical roots in the City of Pittsburgh and is proud to be known as The Pittsburgh Firm. The lawyers of Flaherty Fardo Rogel & Amick have been recognized for their achievements by inclusion in numerous publications including: Superlawyers, Million Dollar Advocates Forum, Multi-Million Dollar Advocates Forum, Pittsburgh Magazine Top Attorneys, Trib Reader Awards Recipient, Elite Lawyers of America, Top 100 Trial Attorneys, and have received an A+ from the Western Pennsylvania Better Business Bureau. The attorneys of Flaherty Fardo Rogel & Amick are all Pennsylvania trial lawyers and over 95% of the practice is devoted to litigation. The firm routinely handles cases throughout Pennsylvania and have obtained verdicts, settlements and/or awards in numerous Pennsylvania counties including, but not limited to: Allegheny County, Beaver County, Butler County, Westmoreland County, Washington County, Fayette County, Clearfield County, Mercer County and Elk County, Pennsylvania. Attorneys Shawn Flaherty and Noah Paul Fardo both have helped to obtain million dollar settlements for victims of personal injury and medical malpractice cases. The law firm is committed to the success of the firm, their clients, their families, and the community. The firm is proud of the close relationships we have maintained with past clients over the years. 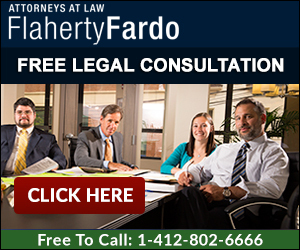 Flaherty Fardo Rogel & Amick offers free legal consultations by calling 412.802.6666 or sending an email to info@pghfirm.com. Let Us Help You Please explain how we may help you?